Applications for students to apply for a Kate Barlow Award are open until 6th February 2017. As many of you know, Dr Kate Barlow was the former Head of Monitoring at the Bat Conservation Trust and sadly passed away in 2015. Kate and her colleague’s work in developing and running the National Bat Monitoring Programme has been instrumental to our understanding of UK bat population trends and has influenced bat conservation projects around the world. The Kate Barlow Award has been set up to honour Kate’s memory and to encourage the next generation of bat researchers, with the generous support of her family and friends. The Award will be open to Masters or PhD students anywhere in the world conducting research which has direct relevance for bat conservation. An annual award of up to £4,500 will be made to one student. The Bat Conservation Trust, who will administer the award, will also pay for the award winner to attend either the BCT National Bat Conference or another relevant bat research and conservation conference. Fundraising is continuing to support this award – there is a link for donations at the same web page. Cull of Mauritian Fruit bats Announced. The Bat Specialist Group is very strongly opposed to the planned cull of the threatened Mauritian Fruit Bat by the Government of Mauritius. A formal IUCN SSC Position Statement is available for download below. ​To read more on this topic, please visit the Mauritian Wildlife Foundation web site here. More information is available from the IUCN SSC here . Aloha, Ope’ape’a! Meet Hawaii's official land mammal, the endangered Hawaiian hoary bat. 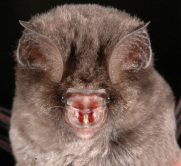 Govenor Ige has signed a bill making the Hawaiian Hoary Bat, Ope'ape'a, the official state "land mammal". Historical agreement signed binding North America, Canada and Mexico in their commitment to work together for bat conservation. After over a decade of work involving multiple institution and individuals across international borders, a new international agreement has been signed to promote and coordinate efforts to protect bats across North America. Charles Francis, Jeremy Coleman, Rodrigo Medellin (the three appointed points of contact for this agreement), Mylea Bayless, Rob Mies, and dozens more bat scientists and conservationists have succeeded in making bat conservation a priority for the governments of Canada, Mexico, and the United States. The agreement was signed at the Trilateral Committee for Wildlife and Ecosystem Conservation and Management meeting April 13-17, San Diego, 2015. A tribute to Dr. Adwan Shehab, BSG member for Syria. This afternoon Andreas Streit of UNEP/EUROBATS shared with us the shocking news that our friend and expert from Syria, Dr. Adwan Shehab, has been shot dead by a sniper. Adwan has attended the EUROBATS meetings for quite a number of years and was known to all as a very sympathetic, cheerful and committed expert who has contributed a lot to the successful work of the Eurobats Agreement. Adwan is leaving behind his wife and four children as well as many friends and colleagues who we join in our thoughts. This cheerful picture of Adwan was taken at the 18th Meeting of the Advisory Committee to EUROBATS, the last one that Adwan was able to attend due to the increasingly difficult situation in his country. As you all know, we have turnover in SSC Specialist Group Chairs all the time. However, today we need to mark a special event, as our good colleague Professor Paul Racey is handing over the position of Old World Chair of the SSC Bat SG to Dr Tigga Kingston. Paul has served with distinction in this role for almost 30 years and will be hugely missed. Over this time he has been responsible for most of the bat conservation initiatives of the BSG and has been a great pleasure to work with. So please all join me in thanking Paul for his exceptional services to bat conservation in general and to the BSG in particular. Please also welcome Tigga to her new role; she will serve alongside Prof Rodrigo Medellin who is continuing as New World Chair of the SSC Bat SG. Once again, many thanks Paul. The Bat Specialist Group has replaced our single Red List Authority Focal Point with two people: one to act as Focal Point for the New World and one for the Old World. These are very important positions, as the Red List status of a species is a major factor determining what conservation action it attracts. Donors in particular are increasingly influenced by Red List status. The WCPA-SSC Joint Task Force on Biodiversity Protected Areas in collaboration with the Institute of Zoology, ZSL and WWF, is tasked with conducting a global assessment on the best predictors of success for protected areas in conserving biodiversity. To achieve this, the Task Force is making use of population abundance time series data. This project is developing well and has assembled enough data to run initial global models. In order to strengthen the results, the Task Force is continuing to look for population abundance data from additional areas, and for more species. Below is a data request sheet which gives further background on the project and the types of data required. We are hoping that you could circulate the request sheet as widely as possible throughout the membership of the Bat Specialist Group and if you have any further questions about the aims of the project or the way contributed data will be held or utilised then please do not hesitate to get in touch with me:sarah.whitmee@ioz.ac.uk. A spreadsheet is attached that shows the data collected by the Task Force to date, for species in your Specialist Group. This might be useful to help you assess gaps in our work. If this information is of value to your ongoing work, we are of course happy to share it (subject to any conditions from the data donor). Any data received will be duly referenced and credited. Your help with our research is very much appreciated. With deep sadness we have received the information, that on 8 March our dear friend and colleague Irina has passed away at the age of 74 after a life dedicated to science and bats in particular. Irina has worked for more than 50 years at the Institute of Zoology of the National Academy of Sciences of Azerbaijan. She has taught generations of students and her written legacy consists of more than 100 publications including her outstanding monograph “Bats of Azerbaijan”, published in 2005.We shall miss Irina very much after so many years of her active and most competent involvement in the work of EUROBATS and shall always remember her wonderful, warm hearted and modest personality. Irina has left behind her sister Liliya Huseynova Balaevna, to whom we would like to extend our sincere sympathies. of the Azerbaijan University. She specialized at the department of zoology of terrestrial animals, during student years – interested by birds. After graduating the university she was assigned to the village school, where she worked for determined years. In 1965, Irena started to work in the Institute of Zoology of the Academy of Sciences of Azerbaijan . Kh.M.Alekperov, Irinas supervisor, proposed her to study bats, the most poorly known mammals of the republic. Then, in Moscow, Irina met Aleksandr Kuzyakin, who agreed to be a mentor (together with Kh.M. Alekperov) for her further research. In 1967 she started her post-graduate studies in the Institute of Zoology and began wide expedition research of bats in main nature provinces of the country , and continued previously started work in Nagorny Karabakh and the Lesser Caucasus. Her PhD. Thesis “Bats of Azerbaijen” was defended by Irina in 1971. In 1992, she wrote her dissertation for the degree of “doctor of sciences”. In 2005, she completed a monograph “Bats of Azerbaijan (fauna, ecology, zoogeography)”. 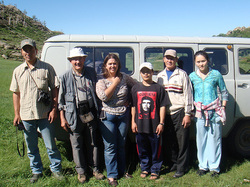 A workshop on bat research techniques was held at the Mongolian State University of Education in Ulaanbaatar, Mongolia on 24th May 2011. This was a quite unique workshop because it brought together local researchers, students, and park biologists who are interested in bat research in the country for the first time. Also the workshop’s special focus was on bat echolocation and using acoustics research techniques for bat research in Mongolia. The workshop idea was initiated by Cori Lausen, a bat expert from Birchdale Ecological Ltd., Canada and supported and organized by the Wildlife Science and Conservation Center of Mongolia. In Mongolia, there are not many researchers who study bats and bat diversity of the country is still not well known. The workshop provided a rare one-day opportunity for local researchers to share information and discuss about bats and learn about the current conservation and research status of 20 bat species in Mongolia. The training part of the workshop used two types of bat detectors: zero-crossing and full spectrum. Pparticipants practiced analyzing bat echolocation data recorded in Mongolian Gobi by Dr. Cori Lausen and her Mongolian colleague Ariunbold Jargalsaikhan. Software and equipment used for the training were donated by the world’s leading bat detector and software manufacturers: Sonobat, Wildlife Acoustics, and Titley Scientific. At the end of the workshop, the equipment and software licenses were donated by the manufacturers to Mongolians for their future bat research activities in Mongolia. The workshop was well attended by the students from Mongolian State University of Education and National University of Mongolia, and there was a great interest among students to participate in bat research and conservation projects. 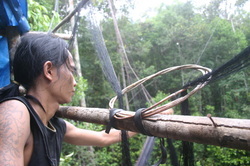 In an important paper in press in Biological Conservation (doi10.1016/jbiocon.2011.06.021), Harrison et al describe how questionnaire surveys of hunters and market vendors in Central Kalimantan revealed decreasing availability of flying foxes, from which it can be inferred that populations are declining. This trend looks likely to continue and Kalimantan, like other parts of the Old World tropics, will lose the ecological services that these bats provide. They are purchased for food and in the mistaken belief that their consumption relieves the symptoms of asthma .Hunters and vendors are frequently bitten and are unaware of the risks of contracting diseases from the bats. 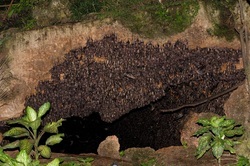 Information from bat biologists, the Department of Environment and Natural Resources (DENR), cavers, and others has made it clear that Philippine cave bats face many threats, but we currently lack information on the population status, distribution, and threats to bats to form the basis for management planning. Bat Conservation International, Monfort Bat Cave and Conservation Foundation and Philippine Bat Conservation convened a Cave Bat Workshop held on 24-28 January 2011 on Samal Island, to address this objective. Participants included bat biologists, DENR regional staff, and representatives of member organizations of the Philippine Speleological Society. A preliminary report is available to download below. The Latin American Bat Research Network (RELCOM for its Spanish acronym) was launched in August of 2007 during the 14th International Bat Research Conference in Merida, México. RELCOM currently consists of a group of over 10 countries, each of which has established National Bat Conservation Programs. RELCOM met in La Tirimbina, Costa Rica, for four days in December 2009, with the goal of sharing bat conservation program strategies, results, and achievements common to the region, and formalizing a new Latin American Bat Conservation Initiative. 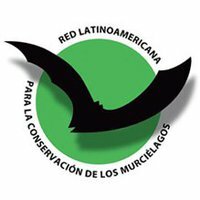 This initiative outlined common priorities and actions to be implemented to achieve region-wide conservation and recovery of bats across Latin America and the Caribbean. In addition to regional bat specialists, a network of professors, researchers, and environmental educators have been invited to participate in the meeting to promote cross-country and cross-sectoral collaboration that promises to provide fruitful initiatives across the richest region of bat diversity in the world. .
BSG members in action: Dr Kate Jones and Prof. Paul Racey. Global projects are trickier than one anticipates. Stranded in an old Russian 4 wheel drive van on loan from ZSL’s Steppe Forward Program (run by Jonathan Baillie) in a river just outside the ancient city of Karakorum in central Mongolia, is just one of the challenges faced by we begin our journey with CSG members Kate Jones and Paul Racey, as narrated by Dr. Jones. It all started well enough, after meeting Jargal Jamsramjav at the Mongolian Steppe Forward meeting at ZSL in 2006, I was struck by the sheer beauty and scale of Mongolia and totally unimpressed by the little that was known about their bats. This would be an ideal place to expand the Indicator Bats (iBats) Program – wide open steppe – jeeps – strap a bat detector to the roof – drive around – monitor bats – perfect. So with some money from The Darwin Initiative, I set out in July with an iBats co-conspirator and bat expert Prof. Paul Racey from Aberdeen University on a 10 day scoping trip to investigate the feasibility of setting up an iBats project there. Riots in the capital Ulaanbaatar two days before we arrived weren’t a good sign, but apart from the burned out communist headquarters and the Museum of Modern Art, there was little evidence of any problems when we arrived. Paul and I spent the first few days meeting people from ZSL’s Steppe Forward Program, National University of Mongolia, Mongolian Academy of Sciences and civil servants from the Department of Natural Resources. Having explained what we were proposing, everyone seemed keen and enthusiastic about setting up a bat monitoring program and promised the required set of supportive letters for the full proposal that we wanted to submit to Darwin in August. So far, so good. Then I decided that what we really needed for the proposal was some evidence that the iBats transect method could actually be used to monitor bats in Mongolia. This required going out into the field – doing actual field work – me in the field - in the wilds of Mongolia. I was scared. Of course I hadn’t brought the right kind of field equipment, so Paul and I got kitted out in the friendly camping shop who seemed both amused and bemused by my totally lack of knowledge of any of the stuff in their shop. I convinced The Steppe Forward Program to lend us their truck and one of their staff Batbayar (Baggie) decided to come with us bringing his very pregnant girlfriend Naraa. Also along for the ride was Ariunbold (Mongolian State University of Education) and his student Munkhnast and of course our crazy driver Bataar. So with lots of food (mostly noodles and some tinned unidentifiable meat), vodka (and back up vodka), fuel, my trusty GPS (Jason) and 6 maps, we all headed off into the wilds. I was thinking how wild can it be, right? There are roads and stuff – just drive around, camp, do transects, drive back – it will all be fine. Err, no. Firstly, the word ‘road’ needs some clarification. There are roads but mostly they consist of dozens of parallel dirt tracks and driving on them in the truck was like (and I quote from Paul) ‘being in the cabin of a small boat in a storm, leaking petrol’. Secondly, ‘just drive around’ – well, finding which particular dirt track you are supposed to be on even with Jason and 6 maps was quite tricky and Ariunbold resorted to the Mongolian version of the GPS – the Ger Positioning System, which involved asking local herder families the way. This led to us being invited in their gers and being offered various milk products ranging from milky tea, dried milk in lumps, dried cheese in harder lumps, dollops of double cream, and fermented horse’s milk – which was like fizzy slightly alcoholic yoghurt. Also, and this leads me to my current predicament in the river, Mongolia had seen a lot of rain over the past few weeks and the dirt tracks were more like rivers. Just outside Karakorum, the driver Bataar in a slightly crazed move decided cross this particular river at top speed. Whether the river was fuller than he thought or he hit a particularly big hole I don’t know, but here we were stuck and filling up with water fast. I abandoned ship with Baggy’s pregnant girlfriend and all the bat detecting gear and left Paul inside (he was busy changing into his swimming trunks). Wading to the shore I was met by a huge 4x4 manned by one ‘Prof. Dr. Dr. h.c. Michael Walther’ who had every kind of equipment known to man on his vehicle. Michael casually winched us out of the river (with Paul still inside), remarking that this happens all the time in Mongolia. By some miracle the trusty truck started first time and we all set off again unscathed. We managed to do four 40km iBats transects in different habitats around Mongolia over the next few days and heard lots of bats, so the scoping trip was a success after all. That is apart from the last transect around Lake Oguii which, in a comedy/tragedy moment, ended prematurely by us getting stuck in a swamp (it took us 18 hours and much effort to dig the truck out of that one). It is an absolutely breathtaking country, big sky wide-open landscapes filled with wonderful wildlife and a people with a rich cultural heritage. I hope that we will be back soon, although Paul swears that he is never going in the field with me again unless I take hard currency with me. By the way, does this trip mean that I now qualify as a field biologist – can I get some sort of certificate? The IUCN is 60 years old this year and the Species Survival Commission (SSC) is only a year younger. 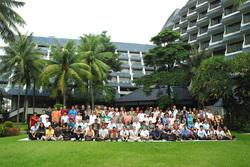 Until February , the Chairs of its specialist groups had never met together with their Chair and IUCN staff. When Holly Dublin was appointed Chair nearly four years ago she began a structural review of the SSC which had operated in much the same way for several decades. Specialist Groups (SGs) were reviewed and some Chairs were replaced. Those groups that had effectively restricted themselves to red listing were renamed red listing authorities (RLAs), with “focal points” instead of chairs. Holly and her colleagues then secured the generous financial support of the Abu Dhabi Environment Agency to organise the first ever meeting of SG chairs, RLA focal points, senior staff of the SSC and its Species Programme, together with representatives of other commissions, and the IUCN Director General. 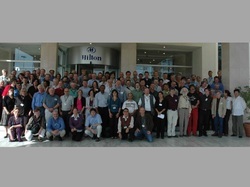 This provided a unique and historic opportunity for chairs to get to know one another, and to discover how different groups functioned, and how IUCN itself functioned. The meeting was a huge success, in reinforcing and encouraging the work of SG Chairs, all of whom are volunteers. It was not however without its tensions, principally over the Chair’s wish to separate red listing and conservation functions to the extent of holding parallel sessions which required those present to chose whether they saw themselves as red listers or conservation practitioners. This provoked strong dissent and eventually the schedule was redesigned so that all could attend both sessions. But what was driving this separation? There was clearly some concern that as more conservation and management decisions were predicated on red list designations these might be legally challenged in future, especially for commercially valuable species. However, peer review of red list assessments was suggested in order to make the process more robust and this met with wide approval. Overall the meeting was a huge success and the SSC has been greatly strengthened as a result. The chairs themselves are invigorated and will redouble their efforts to support the network of 7500 members to heed the dictum of IUCN’s Chief Scientist Jeff McNeely: “Let no species go extinct without a fight”. Posted by : P.A.Racey, Regius Professor on Natural History, University of Aberdeen, Co-Chair BSG. The workshop was convened by IUCN – The World Conservation Union, in Zamorano, Honduras from January 25th until the 29th, 2008. The small mammals assessed included bats, rodents, insectivores and marsupials. This workshop was the last in a series of workshops that form part of the ongoing IUCN-led Global Mammal Assessment (GMA), a project that aims to reassess the conservation status of all of the world's 5,500-odd mammal species using the IUCN Red Listcategories and criteria. Club Andaman Resort Beach Hotel, Patong, Phuket, Thailand. Jointly hosted by Faculty of Science, Prince of Songkla University, Hat-Yai, Thailand Texas Tech University, USA, The Harrison Institute,U.K. . Open meeting.